Guess which tops the list at S$20,000 a night. Here are great places to blow your thousands in one shot on a place to sleep, to take shower and to store your belongings while you go about your day. Singapore Business Review surveyed luxury hotels in town on how much a night stay costs in their most expensive suites. This 85 - 199 sqm Suite commands top-floor views of the Singapore skyline. It comes with spacious and elegant living and dining room, two marbled bathrooms and exclusive in-room facilities such as private sauna and Jacuzzi. This 210 sqm two-bedroom Suite offers a luxurious furnishings complemented with artwork and antiques decorated with lavish chandeliers. Its features include private dining area and private balcony offering panoramic views of the Marina Bay. This Suite offers a fusion of Eastern and Western aesthetics. It comes with marble flooring, 52-inch LCD TV and a spacious balcony that runs the full length of the Suite. This 153 sqm Penthouse Suite lets you refresh in an Elemis bath amenities and indulge in an exclusive privacy at the hotel’s top floor, with panoramic views of Orchard Road, the city’s lively main shopping district. At 143 sqm, this Suite includes a living room, dining room, pantry, powder room, bedroom and a walk-in wardrobe. It is equipped with large marble bathroom with bathtub and separate glass shower stall and extensive bathroom amenities. This 156sqm Suite offers a generous features including 50-inch HD television, walk-in wardrobe and luxurious toiletries. Equipped with a kitchenette and a dining area, this Suite lets you feel at home away from home. The 152 sqm Suite is decorated in a luxurious golden acer with rosewood wall panels and marble in creamy tones and embellishments of textile art. It is dubbed as the hotel’s most lavishly-appointed expression of luxury with double-glazed floor-to-ceiling windows in all rooms and an exclusive balcony. At 260sqm, this Suite offers the grandeur and charm of an aristocratic mansion. It boasts with their spacious lounge, leather-panelled study, lavish bedroom with a walk-in closet, bathroom with sauna, pantry and a grand dining room with its own rooftop garden, all serviced by a private lift. This 152sqm Suite allows you to step into spacious residential elegance. It offers stunning vistas of Singapore's city skyline and striking view of Marina Bay through its dramatic floor-to-ceiling windows. This 242 sqm Suite offers spacious living room and a private balcony to enjoy views. Indulged with elegant Asian figurines and artwork touches, the suite’s décor highlights both their Oriental heritage and the hotel’s location from the carpet to its furnishing. Located on the 17th level, this 348 sqm Suite is served by a private entrance and elevator. It comes with a large balcony that offers a panoramic view of their lush gardens and the surrounding cityscape. This 199 sqm Suite is formerly the card room of the elite Singapore Club. It is furnished with a baby grand piano and has a private elevator for discreet access. The living and dining room extends out to a spectacular glass-enclosed verandah graced by 20-foot Doric columns. 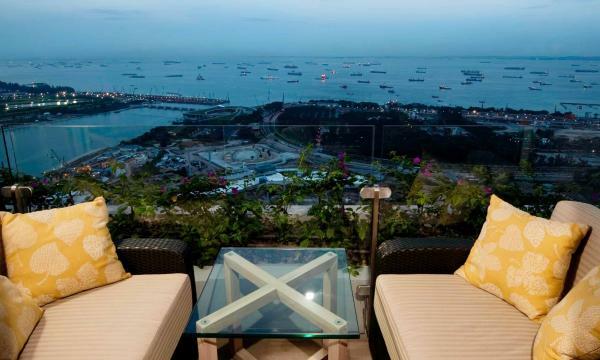 Dubbed as 'perched high above Singapore', this 199sqm Suite is located at the 19th floor. It features an elegant residential ambience with city skyline and pool view. It comes with one full marble bathroom in each bedroom with double vanity, separate shower and tub, private WC and bidet. The 218sqm Suite is located on the highest floor of the hotel at Level 32, with continuous wrap-around waterfront and cityscape views of the Marina Bay. The Suite is equipped with museum quality art pieces with spacious living area. It is ideal for intimate gatherings or entertaining with plush sofa seating and armchairs. Located on the 16th floor of the Terrace Wing, this magnificent 252 sqm Suite offers panoramic views of the city. Indulge in their king-sized soft goose down bed with spacious attached bathroom fitted with whirlpool and sauna facilities. Billed as the largest suite in Raffles Hotel Main Building, this Suite differs in its premier location in the hotel, their spaciousness including 14-foot ceilings and common veranda, and elegant period furnishings including Oriental carpets arranged on teakwood flooring. This 195sqm Suite allows you to step through floor-to-ceiling sliding glass doors onto the stone terrace for rejuvenating breezes and panoramic vistas of the South China Sea and Quayside Isle. Found on the penthouse floor, this 335sqm Suite offers sophisticated living. Each room is embellished with the most intricate details, lined with gold, and accented with precious metals like brass, onyx, and silver. Hand-painted silk panels adorn the walls, while custom-made Czech crystal chandeliers cast a warm glow. Sharing your residence are some of the world's most prized art works by masters such as Marc Chagall, Mark Tobey, Le Pho and Sam Francis. Guest are entitled to complimentary return airport transfers in luxury limousines, and access to privileged rates for the St. Regis Continental Flying Spur Bentley or luxury limousines throughout stay. Capella Singapore offers an experience to travel back in time to the colonial era with their Colonial Manors. 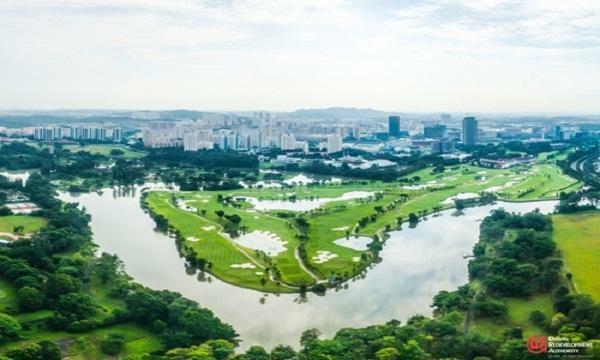 Standing at 436-sqm each, the two Colonial Manors are dubbed to be the crown jewels in Capella Singapore’s rich collection of suites, villas and manors. The Colonial Manors are two of four heritage buildings in Capella Singapore given conservation status on 7 August 2000 under the Conservation of Built Heritage. Offering all the charm and glamour of a black and white bungalow, The Colonial Manors are also available with the service trappings of a luxury resort. Experience ultimate luxury at this 629-square metre suite. The Chairman Suite comes with your choice of black-and-granite or gold-and-earth colours. Set high on levels 53 and 54, the suite offers unobstructed views of the picturesque Singapore city skyline or lush Gardens by the Bay from three bedroom balconies. Guests are entitled to privileges including access to the world-famous Marina Bay Sands swimming pool in the SkyPark, entry to the Banyan Tree Fitness Club, and The Club at Marina Bay Sands.